The Howardian Hills, Area of Outstanding Natural Beauty, lies between the Vale of York, the North York Moors National Park and the Derwent Valley. It covers 77 square miles of rolling hills, woods, fields, pastures, fens, rivers and historic parkland and within is beautiful and distinctive landscape are many farms, scenic villages and some of the finest stately homes in the north including Castle Howard after which the area is named. Castle Howard is an impressive stately home in North Yorkshire, 15 miles north of the City of York and about 5 miles from Malton, has been the home of the Howard family for more than 300 years. Built near the site of the ruined Henderskelfe Castle it took more than 100 years to build Castle Howard and was designed by Sir John Vanbrugh for the 3rd Earl of Carlisle. Vanbrugh died in 1726 before the West Wing was started and the house still remained incomplete on the death of the 3rd Earl in 1738. Construction of the West Wing began with the direction of the 4th Earl and was not built to Vanbrugh’s design but to a contrasting Palladian style designed by Sir Thomas Robinson the 3rd Earl’s son-in-law. At the death of the 4th Earl in 1758 the wing was still not complete and after the death of Robinson the rooms were completed stage by stage over the following decades. It was completed in 1811. It is now a Grade l listed house and there are many other listed structures on the estate several of which are on the Buildings at Risk Register the house is also part of the Treasure Houses of England heritage group. The house is surrounded by a large estate which at the time of the 7th Earl of Carlisle covered over 13,000 acres and included the villages of Welburn, Bulmer, Slingsby, Terrington and Coneysthorpe. The estate was served by its own railway station from 1845 to the 1950’s. On 9th November 1940 a fire destroyed a large part of the house including the central dome. Some of the devastated rooms have been restored over the years but some were superficially restored for the 2008 filming of Evelyn Waugh’s novel Brideshead Revisited but is most famous for its appearance in the 1981 television serial Brideshead. 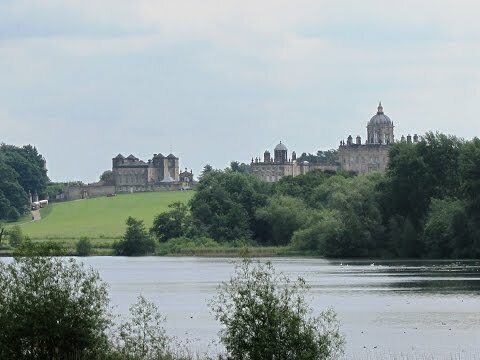 Castle Howard has also been used as a backdrop for a number of other cinematic and television settings and in recent years has featured in the 1995 film The Buccaneers and Garfield: A Tail of Two Kitties, released in 2006, the sequel to Garfield: The Movie. Farming has been one of the mainstays of Castle Howard Estate and today over 6,000 acres are given to agriculture and their local produce can be bought from Castle Howard Farm Shop. Park Farm, Castle Howard’s home farm, is situated about 1 mile north-west of the main house and they also have fully equipped let farms and several bare land lettings on the estate. Forestry is also important to the estate with nearly 2,000 acres of woodland divided equally between coniferous and deciduous trees which are managed by their own Forestry Team for commercial timber production and amenity value. Castle Howard house is not just about magnificent architecture the interior is stunning containing world famous collections from frescos and furniture to paintings and porcelain. Visitors are free to wander through the rooms at their leisure and there are knowledgeable guides located throughout the house who are ready to answer questions and bring alive the stories of Castle Howard from tales of the Grand Tour and Rosalind the radical 9th Countess through to the recent restoration of fire damaged rooms and the installation of a new eco friendly heating system. Castle Howard has extensive and diverse gardens with statues, temples, lakes and fountains. There is a large formal garden which merges with the estates English landscape park where there are two major buildings the Temple of the Four Winds and the Mausoleum. Further buildings outside the preserved gardens include the ruined Pyramid which is being restored, an Obelisk and several follies and eye catchers in the form of fortifications and a John Vanbrugh ornamental pillar known as the Quatre Faces stands in nearby Pretty Wood. The arboretum called Ray Wood is an 18th century walled garden containing decorative rose and flower gardens. There is also a separate arboretum called Kew at Castle Howard but has separate entrance arrangements. The house is now home to the Hon. Simon and Mrs Howard and their two children, Merlin and Octavia and with a total of 145 rooms it is one of the largest country houses in England. The house has been open to the public since 1952 and is an ideal place for families with children with 1,000 acres of gardens to play and run around in. Young children receive free copies of Geoffrey the Lion’s illustrated trails to entertain them as they explore the house and grounds. There are tractor-train rides to the lakeside adventure playground or at the lakeside there are boat trips onto the Great Lake both are great for parents too, there are cafe’s, snacks and ice creams at The Boathouse and Coffee Shop also a farm shop, gift shops and a garden centre. Coneysthorpe is a very small attractive village on the edge of the Castle Howard Estate and comprises of two rows of houses separated by a large village green with a lovely early 19th century Georgian chapel that has recently been restored and refurbished set in the centre at the top end and a War Memorial at the other end. The Centenary Way that runs through its centre is 83 miles long and was devised to celebrate the 100th anniversary of Yorkshire County Council. It was opened by Chris Brasher in 1989 to mark the Centenary of the governance by County Councils. The route runs across the Howardian Hills and Yorkshire Wolds via Castle Howard and Wharram Percy, linking York and the Foss Walk with the Yorkshire Wolds Way and the Cleveland Way. The route starts at York Minster and ends in the coastal resort of Filey and along the way it meets with the River Derwent and River Foss combining riverside walks in deep valleys with forest tracks and part of the route overlaps with the Wolds Way which also ends at Filey along with the Ceveland Way. We stop the car to view the Monument and the Archways along the long avenue that lead to Castle Howard and then drive forward to view the Obelisk and then drive on to the free car parking area opposite the Great Lake with a beautiful view of Castle Howard in the back ground. Starting our walk from the car park we turn left and then turn right at the cross roads sign posted Coneysthorpe. We walk along the side of the road and after passing Coneysthorpe village and the green on our left we turn right through a white gate in the wall. We head forwards on the track going through a gate way and then follow the track round to the left. We turn right off the track at the sign post for Welburn and follow the footpath through the trees and bracken until we come to a large white gate where we go through the little gate on the right. We now follow the wall on our right to the Temple of the Four Winds which you can see in front of you. We then head across the field to cross over the New River Bridge then head forwards to meet the tarmac track (Centenary Way). We turn left following the sign post for Huttons Ambro and walk along the tarmac track. The Centenary Way turns off to the left but we keep heading forwards slightly downhill. The track turns sharp left and then right in front of Low Gaterley towards High Gaterly and we follow the track over a little stream and uphill round the bends. Just before we reach the top of the hill we leave the track and take the footpath over the stile on the left signposted Welburn Lane. We head across the field to the corner to go through a gate and follow the hedge on our left. When we come to a track (Bridle Way) we turn left signposted Easthorpe and walk downhill towards the house in the distance and then slightly uphill to go through a gate and head forwards. Just after passing the house on the left and at the gate we turn left at the sign post for Braygate Street. We follow the footpath round the back of the building and then along the track and bridle way with Spring Wood on our right. The track and bridle way turns right uphill signposted Park House and then left round a dog leg to the road. We cross straight over the road going through the entrance to Park House and Easthorpe Farm. We walk up the drive and just before the buildings we turn left through the gate and follow the fence round to the right to go through another gate and turn left. We now walk along the top of Coneysthorpe Banks Wood with the wood on our left and the fields on our right until we come to a cross roads of paths we follow the signpost for Slingsby Bank into the wood and after a short way we come out of the wood and keep following the bridle way with fields on our right again. After about half a mile we turn left onto the Centenary Way, signposted Coneysthorpe and walk through the wood downhill. At the bottom we head forwards then turn left then right through the gate. We keep heading straight forwards through the fields passing through some gorse bushes then through an arch way of trees until we reach the first buildings of Coneysthorpe. We bear to the left of the buildings and walk forwards through the village and the green to the road and turn right. We follow the road and turn left at the crossroads and back to the car park. An easy mainly flat walk along bridle ways, tarmac tracks and grass fields. There are two moderate inclines and declines. Approx 7.75 miles allow 3 hours using OS Explorer map 300, Howardian Hills and Malton. Start Point: Free car parking area opposite Castle Howard Great Lake. Castle Howard near York, North Yorkshire. Coming from York on the A64 towards Scarborough take the small road at the bottom of the hill on the left sign posted Castle Howard and Slingsby. Follow this road past Castle Howard stately home and grounds entrance to the lake on the right and the free car park is on the left just before the cross roads. Coming from Malton (to view the Monument, the archways and the Obelisk) take the A64 towards Leeds and take the small road at the bottom of the hill on the right signposted Castle Howard and Slingsby then follow this road as above. There are no public toilets on the walk. There are toilet facilities, gift shops and cafes at Castle Howard stately home, entrance fees apply. For refreshments the nearest pubs is the Crown and Cushion at Welburn and the Grapes at Slingsby. The nearest market town is Malton with public toilets and ample shops, cafes and pubs. The nearest city is York.